The WS 550 is one of Quik Lok's most popular stands because it offers a tremendous amount of flexibility without sacrificing strength. All four legs are independently height adjustable and each can be swung into position to conform to any keyboard or synthesizer. 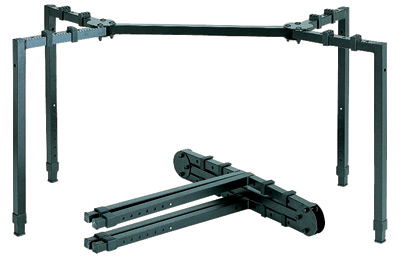 Simply swing legs back and the WS 550 folds to a convenient "T" shape for easy transport. The WS 550 can be expanded to fit your needs by adding any of the available options. In addition, the WS 550 can be used for other applications as well.